It’s that time of the year where you’re likely rushing around to find the perfect presents for your loved ones. Lucky for us, there are tons of incredibly festive and fun seasonal markets going on now in NYC, one stop shops for picking up those game changing gifts for the special someones in your life. Over 100 vendors fill up Union Square this time of year offering unique gifts including many locally, handmade treasures as well as some scrumptous wintertime treats. The Brooklyn Flea/Smorgasborg is a year-round market and during the holidays it moves indoors to a space in Crown Heights (btw. Classon + Franklin) next to the Berg’n beer hall. While the centerpiece of Bryant Park’s Winter Village is the icerink, there are also 125 boutique style shops offering great holiday gift options for all your loved ones. Located in Vanderbilt Hall in Grand Central, the Holiday Fair comprises over 76 shops selling amazing holiday presents – everything from clothing, art, jewelry, home goods, even gifts for your furry friends! 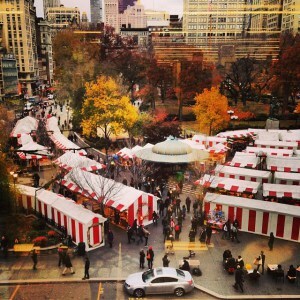 Have you been to any of these holiday markets yet? Any tips on how to best tackle the beast that is holiday shopping this season? Share your ideas and leave your comments below.